The crisp, fragrant fall air has us all enjoying the bounty of the harvest and looking forward to the holidays ahead. Along with the holidays come the many family recipes that we enjoy as traditions and comfort foods. Certainly, you will be taking stock of your kitchen and making sure you have the food prep tools necessary to get you through the next few months. As you think about updating or replacing some of your much needed food preparation tools, don’t forget to think about the items you could use for your preparedness pantry too! For example, I’m a sucker for the aroma of fresh baked bread on a cool fall day. I’ll be using my electric wheat grinder quite a bit in the next few months. As I use my electric mill, I should certainly make sure that I’ve got something available to me should the electricity be turned off. 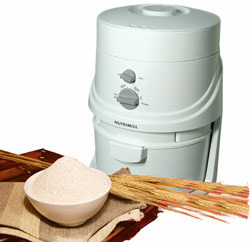 A hand grain mill would be something I should certainly consider for preparedness food preparation. Are you enjoying all that fresh fruit? Could you use some help peeling and slicing it? I know my cobbler would be a whole lot easier if I could use a potato and apple peeler to make quick work of that bushel of crisp apples. Perhaps your family prefers a fresh cherry pie? The cherry stoner is a must have! Many of these items are not only handy to have around for the holidays, but also for your food storage as they are hand operated and do not require electricity. Not only should we be thinking about those big tools, but what about the small and simple things needed to keep your kitchen functioning? Nothing can halt a recipe like a faulty can opener. Think of all the rows and rows of cans you’ve got stored away, now imagine not being able to open them! I recommend storing a few extra can openers just in case. Take a moment and go through your kitchen drawers and update or replace broken or faulty measuring cups, knives, cutting boards, and other food preparation tools. As you prepare for your holiday happenings, don’t forget to think a little bit about your preparedness pantry and the food prep items that would be beneficial during an emergency. Take the time to be sure that you are food prep prepared!